After Madeline died the celebrant we chose for her funeral came to our house. Surfaces had been dusted and polished by friends and family, but all of her toys still sat where we’d played them just days before. She asked us lots of questions about Madeline, and we spoke about her for hours. Together, we constructed Madeline’s funeral. What we wanted her to say, who else we wanted to speak, what pictures and videos would be shared. At one point she offered up her funeral playlist. Of course, she didn’t call it that, but that’s basically what it was – songs you always hear at funerals. Amazing Grace, On Eagles’ Wings, Tears In Heaven. UGH, Tears In Heaven. As if that song wasn’t already a tear jerker. Mike and I politely declined her offer to handle the music and told her we’d put together something ourselves. After the celebrant left, Mike and I slowly combed through our music collections. There were so many songs we associated with Maddie. Lots of them were silly and frivolous, like Single Ladies (Put A Ring On It), the song I’d taken a video of her dancing to just two months before she got sick. Then there were the dozens of songs I sang to her in the NICU. Each song had a different memory attached. We finally picked out a handful of songs to play over her tribute video and during the service. I burned a CD with the songs in the exact order we wanted. I gave the funeral director the CD, and after the service the celebrant came up to us and said how wonderful the music was. I told her to keep the CD to share with other families. When we got home that night, I deleted every song off of my hard drive. I never wanted to hear any of them again. They were beautiful, meaningful songs, but they were ruined. In the two years, three months and four days since her funeral, I’ve managed to avoid hearing any of the songs. One of them is in a movie, so I just fast forward through that part. The others aren’t the typical songs you’d hear on the radio. Yesterday while I was sitting in a store waiting for my turn to be helped, I heard the faint chords of a song I hadn’t heard since April 14th, 2009. The tears were falling before the musician started singing. I was transported back to the front pew of the church. My stomach churned and my knees felt weak. I felt everyone’s eyes on me. The store employee didn’t know what to do. I managed to choke out some words and pointed to what I needed, then I sank back down while he hustled away. I composed myself, and left a few minutes later. When I awoke, dear, I was mistaken, so I hung my head and I cried. I hate that song now. Oh God, I feel for you. While I cannot begin to imagine the depth of your loss as I have no children, let alone lost a child, I feel for you. I happened upon your blog only months after your loss of Maddie and have stopped in nearly daily ever since. And while I have never walked in your shoes, I want to share a blogpost of my own that may to some extent reflect what you are sharing in this particular post. I am 10 years out from my loss and while I have moved on, I have not moved past. I can’t imagine that anyone is ever able to move past the loss of a child. It’s only left to just keep moving and to keep living. So while you are doing that, just keep remembering that we are all here, just simply HERE, in support and love of you, Mike, Annie, and always always Maddie. On Eagles’ Wings was my favorite song to sing at church. But cmon she really picked the most cliche songs. I think there’s more tasteful ones to pick. Good choice to choose your own. Remember, listening to those songs is celebrating Maddie’s life, not mourning for it. I don’t normally comment but I had to one this one. I lost my son in 2009 but August and we played “Carolina on My Mind” at his funeral and then Funny People came out and we went to see it.When they played that song I remember crying and thinking why did they have to pick this song. I have never heard that song before my husband played it and now it was in a movie I saw a few weeks after we buried my son. I am sorry and I feel for you. There are certain songs I just can’t bear to sing to my child because of their lyrics, and You Are My Sunshine is one of them. Also included in the list are Rock-A-Bye Baby (no cradles are falling from treetops on my watch) and Oh My Darling Clementine. Music is such a powerful thing. I’m not much of a crier at movies, but when I saw Knocked Up, the song Daughter made me bawl because I knew, I just knew, that I was going to have a daughter someday and look at her in awe and think, “Who’d have ever thought her?” I hummed it to myself for a few days and then forgot about it for years. And then when I watched Maddie’s memorial slideshow from just weeks after my own daughter was born, I heard the beautiful song for a second time and sobbed again, but this time for a smiling little girl that I never met and her grieving family. I think of both our daughters when I hear that song now, even though I’m just a random blog visitor. Hugs. That’s all I can think of right now. me, too. Massive hugs heather, mike, and annie. Sending a hug to you, Heather, and I get compliments on my hugs so make sure it feels like a really good one. And I held you nearer to me. I use to sing that song to my God daughter Meghan – she LOVED it. So much so she would stop crying as soon as I started to sing it to her. We had it all planed out….when Meghan went down to Sick Kids to have her heart surgery, her mom was going to bring her cell phone in the PICU so I could sing it to Meg while she was coming out of surgery haze and then as soon as she was stable, I would come down to hold her and sing it to her in person . It was the perfect plan only the Dr’s didn’t think so since her surgery got post poned 3 times due to the lack of a bed in the PICU. When I got the BRUTAL call at 4:00 a.m. on that Saturday morning, when my dear friend hysterically told me Meghan was dying “right now”, I kept trying hard to reassured her, like Maddie, our Meghan was the toughest 10 month old there was – God would NEVER take her. I was wrong! I realized as the 4th call came in and my friend told me with absolutely no emotion in her voice Meghan was now with Jesus. I will never forget her dead pan, emotionless conversation she had with me as she gave me a list of things to do, including announcing the passing on her blog. I still cried thinking of that moment, hearing my good friend in a state of complete and utter shock. As I hung up the phone, numb myself the song “You are My Sunshine played over and over again in my own head with the sound of Meghan’s funny little laughter muffling it until it got to the part the song that says “Please don’t take my sunshine away”. Suddenly the sound of a once sweet, little endearing song gave away to the sounds of heart wrenching weeping and vomitting all over myself as I realized what had just happened. It was the day I came to hate that little song too. Songs do have a way of haunting you, don’t they. Several months later I was doing a photo shoot for 2 Mediums who were growing their brands. One asked to see my portfolio as she turned the pages she suddenly stopped at a picture of my Meghan. She looked at her smiling little 5 month old face, and took my hand and said “It’s true you know”! Completely taken back, I asked her what she meant as I fought to keep my tears and emotional at bay. “Just like the one song at her funeral said “She really is in the arms of an Angel and Sweetie….she isn’t hurting, she never was….she just….went to sleep when her little heart did”. Tears silently rolled down my face and I looked at her in awe, wonder how on Earth she would know such things….especially b/c Meghan had no scars, her little lips were actually much more pink than blue and she looked so…..well. She hugged me and quietly whispered “I’m a medium, that’s how I know”. “Tell her mama she is okay b/c honey…she IS okay”. I don’t remember her even leaving as I was so overwhelmed and angry. As glad I was Meghan was okay, I didn’t want her to be in the arms of an Angel. I wanted her to be in her Mommy’s arms or mine!!! Just like I want Maddie to be in your and Mike’s arms. Any ways, look at me going on and on….sorry. My point is, I understand how you feel and now I can’t listen to either of those songs either b/c I hate them too. Stevie Wonder, “Isn’t She Lovely” was one of many songs featured during the funeral of a dear family friend, aged 4. She was my son’s playmate. The song still makes my knees go weak. Music is powerful. Heather. I remember you posted an unforgettable video montage on here not long after the funeral. “That’s my daughter .. in the water.” I watched it a lot, crying for you guys. I’ve sang You are my Sunshine my whole life. To myself, when I was a kid and wondering what it would be like to have a mother that loves you. Many many drunken walks home in my twenties, I would sing it at the top of my lungs. (Sorry neighbors!) To Max, and now to Rocco. I just sang it to him yesterday. That song has morphed and changed with me. Im Sorry Heather. I so wish I could take the your pain away. I cant imagine what all you go threw each day as their are things that remind you of Maddie. My heart breaks for you all!! Oh wow. I have always loved that song, I used to sing it with my grandmother. I can clearly understand why you no longer like it. I’m so sorry Heather. I couldn’t even bear to sing the line Please don’t take my sunshine away in the 1st verse. This is the version that we just sung at my 37 y/o cousin’s funeral. As it was sung her 4 y/o son placed a bouquet of flowers next to his Mom’s picture. It was heartbreaking. Bawling as I put on my make-up….not a great combo. I wish I could just hug you so tight. A song we played at my sons funeral was played during a money dance at a wedding a few months later. Of course ran out and never looked back. That same song is still on my iPod and I listen to the iPod everyday at work. When that song comes on I just skip it. Something about removing the song from my iPad seems too difficult. A memory like that can creep up when you least expect it but in a weird way I enjoy it. There is also a song made popular at the time my son was in the NICU by a well known singer today and when it gets replayed on the radio I just deal with the pain and listen. I am not sure why I endure the pain but if in that moment I can feel a tiny bit closer to him I will take it. He was only 29 days old when he passed so we had such little time. Oh, Heather. Sending you lots of love and tons of hugs. Lots of love and hugs for you and your family. I’ve never liked the second verse of that song. It upset me even as a little kid when my mother sang it to me. 2009 was a terrible year for many of us. Although my loss was different, (my husband bled out, died, re-vived, died again, seven shocks, ambulance, ER, died again the ER, bled out all the transfusions, and died again…then ICU, etc. etc. but he survived and is almost back to full-on-normal)…he had actually taken me to the first Twilight movie and bought me the soundtrack. He collapsed the next afternoon. (No, Twilight didn’t cause it.) So…if I hear or see anything Twilight, it’s like PTSD….total recall. Flashbacks. When I see *our* ambulance (we live in a small town) I can almost faint or go all pale. I burst into tears at a very public place when I heard the song I had not heard since I was waiting in the ER (a song I never even liked or really noticed before). It’s like land-mines…our sense memories. Lots of hugs to you Heather. Even now, almost 6 years after my Dad died, if I hear one of the songs we chose to play at his service, it kicks the breath right out of me and I have to change the station or the TV very quickly. I sing You are Sunshine to my girls all the time but I’ve never sang beyond the first verse and chorus, mainly because I didn’t know it. I’m glad now, that I didn’t. That verse is so sad. Ican understand why you hate it now. Lots of (((HUGS))) to you. I have to tell you, in all honesty, EVERY time I hear that song by Beyonce Put a Ring on It….I see that video of your Maddie dancing. Her bright beautiful eyes and smile! I can’t hear the song and not think of her, and I never even met her. But when I do hear it I say a little prayer for you and Mike, and for Maddie and Annie. I can only imagine what those songs must do to you, if they can create such a strong reaction in a stranger like myself. 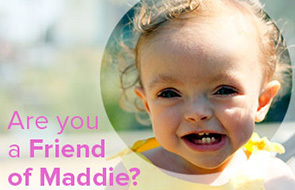 Thank you for continuing to share your sweet Maddie with us through your words and experiences. You do her a great honor and keep her alive in the hearts of many. I sing “You are My Sunshine” to my son as part of his sleep routine. As soon as I start to sing he lays his head down on my shoulder and starts to doze off. For me, the words express how much I love him and how thankful I am that he was not taken from me like is older brothers were 5 years ago. The song makes me teary eyed and makes me think of my twin boys in heaven and I think sometimes I choose it as part of my living son’s routine just to keep the twin’s memory alive. It really hits hard when I hear my 4 yr old daughter singing it to her baby brother. Heather, my heart goes out to you and your family and you are often in my thoughts and prayers. Maddie and Annie are lucky to have you and Mike as their parents. That was my go-to song at the NICU, while my survivor struggled to live. I haven’t gone back to it since. And don’t think I ever will. Thank you for sharing. It’s amazing how many people sing You Are My Sunshine to their kids! And how sad that it had to be ruined for you and Maddie can’t be here to enjoy listening to it. I sing the tune, but I make up my own word for my boys, stuff like, “you are my baby, my sweetie baby, You know I love you, oh yes, I do” mostly because I spent hours rocking and singing Dorian to calm him after surgeries. I sang to him in the womb, too and when he came out and was screaming his head off, I started to sing and he shut up immediately and just stared at me. It’s amazing, the power of music. Oh, Heather. I’m so sorry that song snuck up on you like that. Sending love and hugs your way. I am in awe of your strength. Songs are amazing reminders. I lost my mom to cancer 2 1/2 years ago and when I hear the “Chains are gone” version of Amazing Grace I lose it. I picture her free from her pain….My eyes are watering now as I write this. I remember listening to “should have been a cowboy” with the music really loud on my way to work and laughing because I was pregnant and everything was going to be okay! That’s the last song I remember listening to being really happy. I had aleady miscarried and didn’t know it. I can never listen to that song again. In fact now that I miscarried a second time I honestly listen to NPR. Thank you Heather thank you for making me feel like it’s okay that I don’t listen to music anymore and that I am not being “dramatic” oh ya those words are used. Hugs to you and Mike and Annie. That is a song I sing to my boys, inserting their names where Sunshine goes, but I don’t like that second verse. Even when I was a little kid I didn’t like “You are my Sunshine”–too sad. Same with Darling Clementine and Molly Malone. Hugs to you, Mike and Annie. My cousins funeral is this week, and I was asked to put some pictures together with some music. Just yesterday, I was telling my husband that it felt like such a huge responsibility to choose the music, that any song I picked would be ruined for us all, and that I didn’t want something that may be played on the radio or in a store later and bring tears to their eyes. I felt silly for making such a big deal about the music and for even stressing about song choice at this horrible time. I’m so sorry that you have to go through this, but thank you for posting this at this time, it spoke to me, and makes me feel less ridiculous for worrying about it. I have tears pouring down my face as I read your post and the comments here as well. I pray peace for both you and Mike often. what an amazing, strong, inspiring mother you are. this was humbling to read, many prayers and good thoughts sent your way. I started reading your blog when I was 8 months pregnant with my first child. I started at the beginning and I didn’t know the path your story would take. My baby boy was just a few weeks old the day I read the post that said that Madeline was in the hospital. I cried. And I cried through the next several posts as your went through the hardest days of your life. I sing that song to my little man when he is upset and every time I do, I think of you. That verse reminded me of you, a person I have never met but feel like I know, the first time I gently sang that song into my baby’s ear. I am sorry that song has such a horrible connection to it for you. I am so, so, sorry. Just know that one day you will see her again. Lots of hugs for you and yours. I too sang “You Are My Sunshine” to my baby girl and didn’t think much of the 2nd verse until after she passed. Now it just breaks my heart and when I sometimes sing it to my 2nd daughter, I can’t bear to even sing that part. I attended my aunt’s funeral this morning. One of the hardest things I have ever done. She was a second mother to me and my 3 little sisters. There was a song played this morning that I will never be able to listen to again. I am SO sorry for your loss, Heather and Mike. I can’t imagine what you have been through or what you continue to go through. Know that I think of you often and send you big hugs! My song is “Just Like A Pill” – Pink. There’s no symbolism there, it’s just the only song I could listen to on the way to my grandmother’s funeral. Now, as soon as I hear the first chord, I have to turn. Music is so powerful, and unfortunately, it’s not always in the way that we want. Sending you love, hugs, strength and sweet thoughts of Madeline. She is still so very, very missed. I’m sorry every day that you have to live with such overwhelming loss, but at the same time celebrate the fact that Maddie was here. She existed and she loved and was so loved in return. The pain I just went through reading your posting was so hard and just a fraction of what you have been through. I’m so sorry. There are no other words to say but thank you for sharing your raw emotions. I sing the first verse every night to my 7 month old, replacing “sunshine” with her name. I’ve always ignored the second verse. The first by itself feels like a prayer in a way. I think I’ll always think of you and Maddie from now on when I sing it. My dad died when I was 17 and the song by Mike and the Mechanics “The Living Years” was released around the same time. I heard that song over and over on the radio……I hate that song! It’s amazing how your posts touch my heart every time. This one especially hit my heart. One of my friends mother and sister went up to heaven early this morning and I still remember a song her mom would play on the way to softball. Now I refuse to hear it. My heart goes out to you and all who are affected by songs. They are more powerful than any of us will ever realize. It’s terrible when the most mundane things are turned to poison. “You Are My Sunshine” has always made me cry for some reason… literally since the day I was born, before I had any comprehension of the words. I’m so sorry, Heather. Know that Maddie is loved and remember by many, many people who never even met her. Omg, how hard that must have been. You aren’t the only one to break down in public and definitely not the last. When I was 13 and in the seventh grade, my grandfather died. Two weeks into a new environment with new teachers and going from 4 to 7 classes, he died suddenly in his sleep with no warning whatsoever. I had to take a day off of school for the funeral and I couldn’t tell my teachers the reason why for fear of breaking down in tears in front of them. At the end of that year, the graduating class decided to play the song, “Friends Forever”, aka “The Graduation Song”, over the PA system for the whole school to hear and I just froze. It was the first time that I had heard the song, but the lyrics just made me break down in tears because of the line at the beginning goes, “If you have something to say, you better say it right now because you don’t have another day.” And the another line goes, “I wonder where we are going to be when we’re 25,” and all I could think of was that I was going to be without him at 25. Finally my sister came back into the school building and found me huddled in the corner bawling. Also, my boyfriend can’t listen to ANY version of “Amazing Grace” because of the “funeral” thought of the song because it was played at his grandfather’s funeral and almost every funeral that’s he’s gone to. Also because it’s played at every soldiers funeral. I’m so sorry about your loss and like so many have said, Maddie is loved and remembered by so many that never met her and will NEVER be forgotten. Keeping you in my prayers and Mike, and little Annie, too. Oops, that’s supposed to say a month and two weeks into a new environment. Just want to say that I am sending love your way.